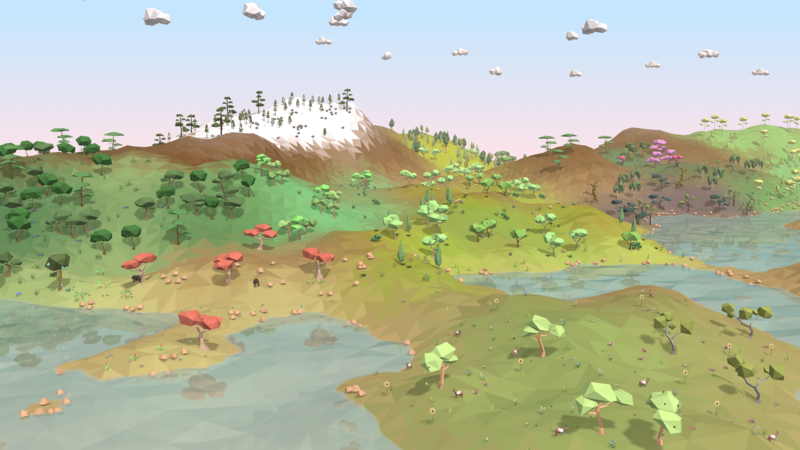 Equilinox is a nature sandbox game in which you transform a barren landscape into a diverse, dynamic, evolving ecosystem of plants and animals. Shape the world to your liking, cultivate and raise hundreds of different species of wildlife, and evolve your plants and animals to unlock new species. Think of it like a city-builder game, except instead of cities you're building and managing ecosystems! Place plants and animals onto the ground or into the water to start creating your ecosystems. As different plants are added the terrain will become more fertile allowing wildlife to flourish, while animals will begin to earn you Diversity Points. These points can be used to purchase more plants and animals from the in-game shops. Every species in Equilinox has its own specific requirements, behaviors and life-cycle. You’ll need to ensure that each species can grow and reproduce in a suitable environment with enough resources, while maintaining a good balance between the various ecosystems. Healthy, happy wildlife will live longer, breed more, and produce more "Diversity Points" which can be spent on in-game resources. Species that are unhealthy, badly nourished or unhappy with their environment may die out or fall sick and infect other nearby animals. New species can be introduced to the world by evolving the current plants and animals that you have in your world. 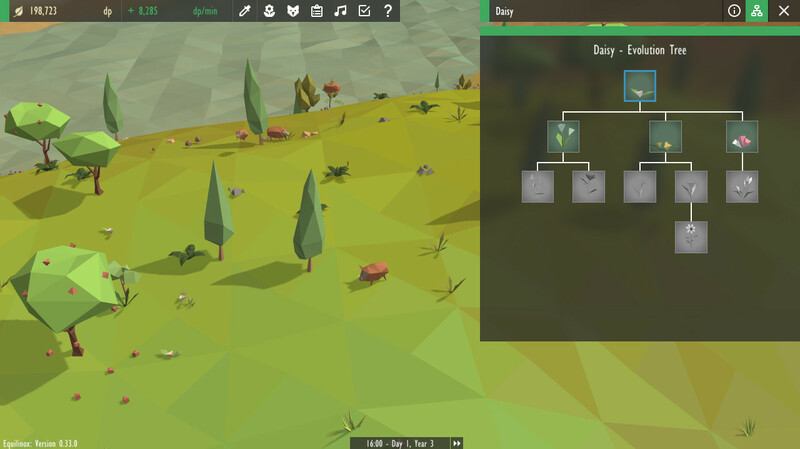 You can work your way through multiple evolution trees to unlock new and exciting wildlife. Through the use of selective breeding and genetic modification you'll also be able to manipulate the traits and behaviors of your species. For example, this could be used to create rare colors of a certain flower, make fruit trees more productive, or make your sheep more resistant to disease. There are many in-game tasks in Equilinox which you can complete to gain various rewards. Finishing tasks will earn you more Diversity Points and unlock new content in the in-game shops. Some of the tasks in Equilinox are repeatable, meaning that you can complete them as many times as you want and claim the reward each time. You can take advantage of this and ‘farm’ various plants and animals for a regular income of Diversity Points. Less than five weeks to go until the launch of Equilinox now! 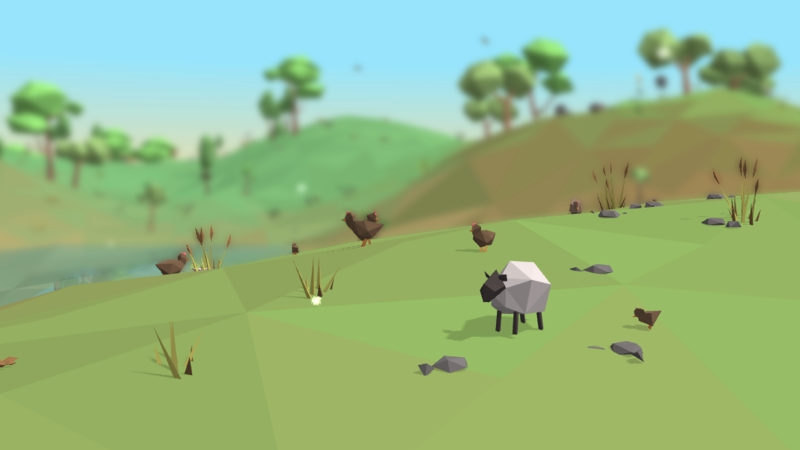 Over the course of the development process I've spent a lot of time testing Equilinox; every time that I add a feature or balance some variables, but I've not often taken the time to sit down and play the game through as a regular player would. So that's what I did last week for about two days straight, fixing bugs, making improvements, and balancing the game as I went. My biggest gripe when playing through Equilinox was that there was no way to see an overview of which species you're currently evolving and which species you would be able to evolve next. In order to do this you would have to click on each species in the world and go to their Evolution tab, to see which species you can unlock by evolving them. To fix this I've added an "Evolving" tab to the progress panel, which shows you all the evolution processes that are currently in progress, along with a list of all the evolution processes you could carry out based on the species that you currently have in the world. It's a great way to get a quick overview of which species you could start working towards unlocking next. I've also been making various little visual improvements to the game in an attempt to polish up Equilinox before the launch. One example of this is the new particle effect that happens when you place objects into the world. It's a very simple effect with a few stones and a bit of dust, but it definitely makes the placing of objects a little bit more satisfying. Speaking of satisfying, I've always felt that completing a task in Equilinox was a little bit underwhelming. The "Claim Reward" button would simply change from blue to green when you clicked on it and the text would change to saying "Complete", accompanied with a rather tame sound effect. So this week I set about trying to make the completion process a tiny bit more satisfying and added a more interesting animation to the claim button when you click on it. Again, it's a very small change but I think it makes quite a difference. All I need now is a decent sound effect to go with it! On top of these little additions to the game I continued working through the bug reports and fixed a few more small issues in the game. The most important of those fixes was probably the underwater icon issue that I talked about in last week's devlog video. That problem has now been fixed, allowing you to see the status icons of underwater species such as seaweed or fish. The "Biome Picker" tool was also slightly improved, and you can now use the right mouse button to move around in the world as usual with the biome picker UI open. A single right mouse click will still close the UI but it now knows not to close when the button is held down and being used to drag the world around. 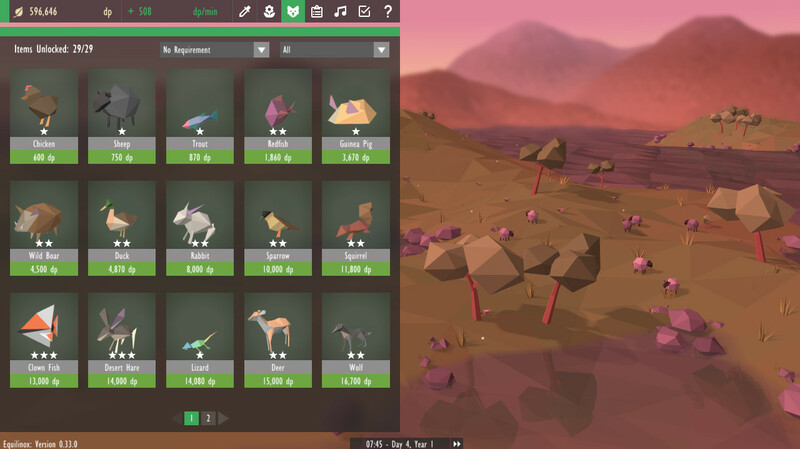 Other than that I did a lot of balancing in the game - trying to sort out prices and traits of animals, as well as doing a bit more preparation for marketing the game. There will be a devlog video next week as usual on my Youtube channel and this week I'm going to be concentrating on making the trailer video and finishing the website. 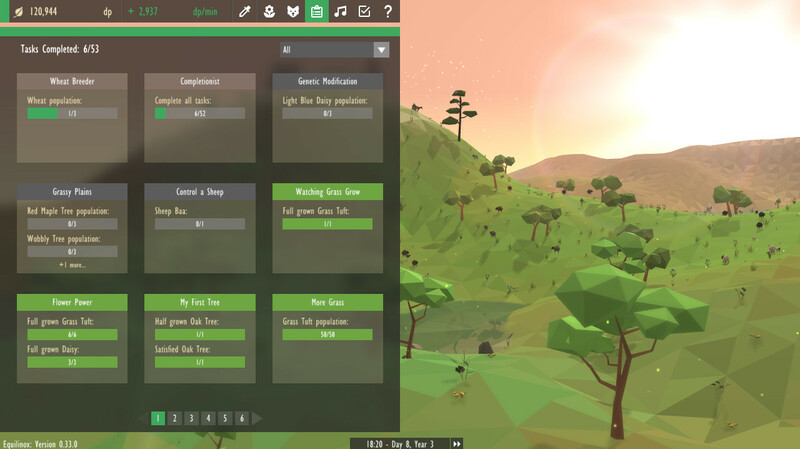 A few final tweaks and improvements to the UI in Equilinox! More improvements and features for the UI this week! This Guy has put in so much work, and it has definitely payed off.